Senegal's Demba Ba is the English Premier League's leading scorer after netting both Newcastle United goals in a 2-2 draw at Reading on Saturday. Previously unhappy with the decision of manager Alan Pardew to use him as a wide striker, Ba has netted five times in three outings. He has six goals overall. Malian Jimmy Kebe and Ivorian Gervinho were also on target in the Premier League, whilst Angolan Manucho struck twice for Valladolid as they eased to victory in Spain's La Liga. 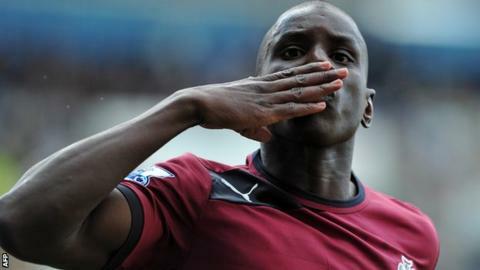 DEMBA BA (Newcastle): The Senegal striker twice equalised in a 2-2 draw against Reading. His first goal was a sublime volley on the run following a clipped pass from Ivorian Cheick Tiote. But controversy surrounded his second when he inadvertently diverted the ball into the net off his hand with an attempted header. JIMMY KEBE (Reading): The Malian opened the scoring in the 58th minute when he slotted a low shot inside the near post but the eventual draw meant his side stay in the bottom three. GERVINHO (Arsenal): The Ivorian drew the Gunners level against Chelsea with a well-worked shot that saw him take just one touch before beating Petr Cech from eight yards, but his goal was not enough to inspire an Arsenal revival as Chelsea won 2-1. He has scored four goals this season, as many as he managed for the entire 2011-12 campaign. Foued Kadir played a key role in ending Marseille's perfect start to the season. FOUED KADIR (Valenciennes): The Algeria midfielder scored one goal and made another as Valenciennes ended Marseille's 100 percent start to the season with a stunning 4-1 win at Stade du Hainaut. YOUNES BELHANDA (Montpellier): Belhanda broke the deadlock as defending champions Montpellier won 2-0 at Nancy to register only their second win of the new season. His Senegalese colleague Souleymane Camara made the points safe in the final minute with a fine 25-yard drive. CHEICK DIABATE (Bordeaux): Giant Mali striker Diabate got on the score-sheet for the first time this season to seal Bordeaux's smash-and-grab 2-0 success at previously unbeaten Lyon. The towering centre-forward out-jumped Mouhamadou Dabo to head home from close range in the 82nd minute, as Francis Gillot's side extended their unbeaten run to 10 games in all competitions. JOEL MATIP (Schalke): The Cameroon international scored his first goal of the season in a 2-2 draw at Fortuna Dusseldorf. Matip hit the target with a well-timed header in the 20th minute from a Christian Fuchs free-kick. DIDIER YA KONAN (Hanover): Three days after scoring twice in a 4-1 win over Nuremberg, the Ivory Coast star was kept at bay by the Hamburg defence in 1-0 defeat. He came close, however, with an acrobatic scissor-kick which went over the bar. KWADWO ASAMOAH (Juventus): Asamoah was used only as a second-half substitute by Juventus caretaker coach Massimo Carrera in a 4-1 win over Roma. Alex Song showed his versatility once again for Barcelona. KEVIN PRINCE BOATENG (AC Milan): Boateng showed an improved performance as the Rossoneri laboured to a 1-1 draw at Parma when they really should have won the match. Boateng had several attempts on goal, but after seeing 'Little Pharaoh' Stephan El Shaarawy - an Italian who has an Egyptian father - score for his side the Ghanaian woke to media claims he had been a "flop". ALEX SONG (Barcelona): It was another assured performance at the back from Cameroon midfielder Song in a 3-2 win over Sevilla, as he deputises in the absence of regular central defenders Gerard Pique and Carles Puyol. MANUCHO (Valladolid): Manucho's Valladolid future was in doubt earlier this year, but against Rayo Vallecano the Angolan produced one of his best performances for the club with two goals in a 6-1 win. OBAFEMI MARTINS (Levante): After making an immediate impact with a winning goal in his debut last week against Real Sociedad, it was a disappointing match for the Nigerian against Osasuna as Levante crashed 4-0. He showed only glimpses of his pace and his only chance was a first-half header that was comfortably saved.